“Premier corner unit available on a high floor of the Capitol Hill Tower, conveniently located just steps from the Navy Yard Metro, Department of Transportation, Capitol office buildings, Nationals Stadium, shops and restaurants on 8th street, and with easy access to 395 and 295. Available partially furnished (bed, wall mounted 46″ LCD HDTV and bose speakers, etc) if desired. Condo is perfectly designed for roommates with two large bedrooms located at opposite ends of the unit. Minimum one year lease. Small pets ok with deposit. – walk to work at the Washington Navy Yard, Capitol Hill, Department of Transportation, etc. 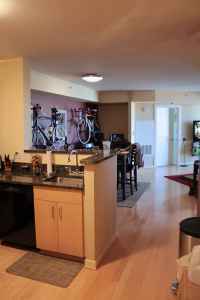 $2650 sound reasonable for this 2 bed/2bath with balcony?